Nicolas Poussin has influenced countless artists in the 350 years since his death. Underappreciated by today's art going public, he's the Dr. Dre of art history's OGs. It's impossible to forget about Poussin. He was a thought leader. Pioneer. Visionary. For example, Poussin created the Theory of the Modes. Basically, the idea that each component of a painting informs the overall emotional experience. He was famous for painting subjects of his own invention or cherry-picked from seldom or never used Biblical and pagan sources. Most artists during this period worked from the same stories. Poussin went so far as inventing a genre, the heroic deathbed, with a painting for the Pope's nephew called The Death of Germanicus. Heroic deathbeds became a hot commodity for decades to come. The demand for heroic deathbeds has cooled in recent times. Although, this is based solely on how people react to our attempt at a heroic deathbed, The Death of David Carradine. The groundwork for such staggering genius (name the number of people you know that invented a genre) was laid with a move from Paris to Rome. This move was facilitated by Poussin's friend Giambattista Marino, the famous Italian poet. Marino promised to pay Poussin's way until the painter could independently earn a steady income. Within weeks of Poussin's move, Marino, in the ultimate friendship bait-n-switch, moved to Naples and died. What a jerk. Poussin could have gone home to Normandy and plied his family trade as a destitute peasant. Instead, he painted. Producing work after work until his craft was perfected and reputation established. Poussin avoided public commissions, chasing after that sweet private patron money. Europe's rich and powerful clamored for a piece by Poussin. In one extreme example of Poussin chasing, King Louis XIII forced his erstwhile subject to become France's First Painter, the one painter to paint them all. The King was a micromanager, taking the one thing Poussin valued above all: artistic freedom. Poussin left the French Court for Rome after just 18 months to pick up his wife. We imagine him knocking on the King's door in the middle of a workday and saying, "Sorry, I have to take a personal day tomorrow. I forgot my wife in Rome." 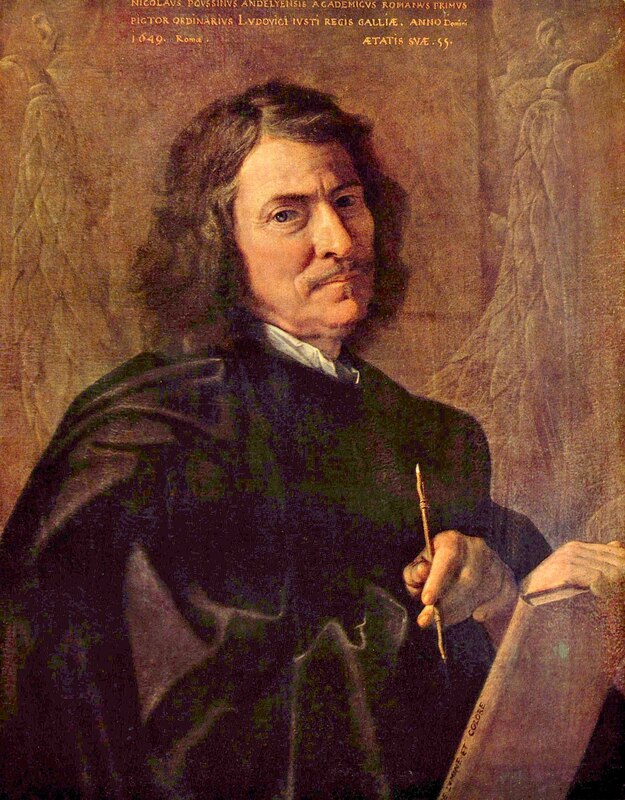 Happy ending: Poussin quit his job in Paris because King Louis and Cardinal Richelieu, the king's closest advisor and a Belieber-sized-mega-fan of Poussin, each died within a few months of the painter's departure. Poussin married Anne-Marie Dughet after staying in her father's home to recover from an illness (Back to the Future much?). The illness just happened to be incurable syphilis (NSFW Back to the Future). Anne-Marie's brother, Gaspard Dughet, was a nascent artist at the time, eventually gaining fame as a landscape painter. However, when they first met, Poussin's star power was so bright that Gaspard took his brother-in-law's surname to cash in on the zeitgeist. The name change probably made a lot of sense in retrospect with Gaspard constantly doodling "Gaspard Poussin" all over his notebooks. Check out the full Wikipedia article about Nicolas Poussin.